All devices have their issues. Knowing how to fix them when they arise will save you lots of time, energy and frustration. In this challenge you will learn how to fix multiple issues you may encounter with daily use of the iPad. Try each of these things to get to know your iPad better! My App Won't Work Right! Sometimes apps just aren't performing correctly, are acting funny or won't respond at all. The first thing to try is to quit and restart the app. 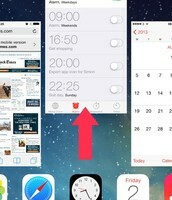 To do this, go back to the home screen and then double tap the Home button on the iPad. The apps that are running will appear. Simply tap them and swipe to the top of the screen. The app will fly off and disappear. You have successfully quit the app. It is good practice to quit apps when you are done with the iPad for a time. It saves battery life and also keeps so many apps from running in the background. Teach your students to do this when they clean up their technology at their station. 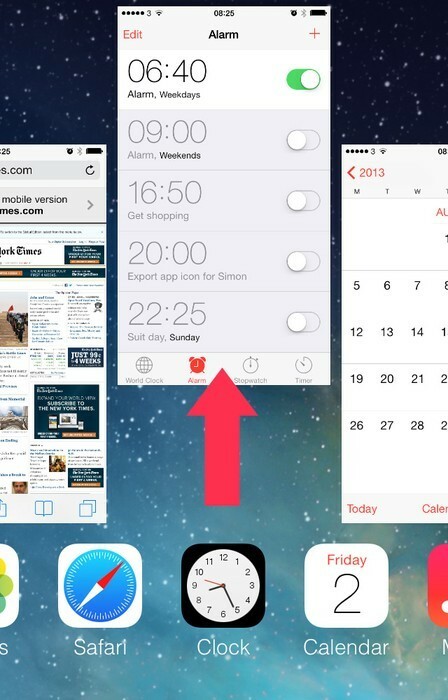 Double tapping the home button will also allow you to toggle between the apps as well. Simply slide the apps to the left or right and tap the app you need to move into. My iPad is FROZEN....Now What? You can restart your iPad two ways. The first is just called "restarting". 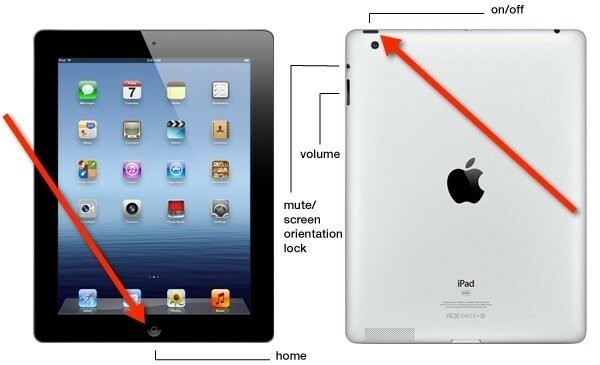 Hold the power button on the iPad down until the power slide bar appears. Then slide to power off as it instructs. 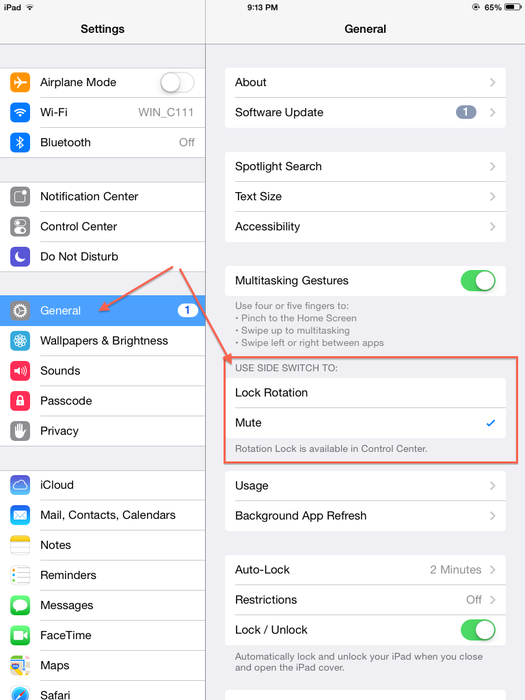 You may want to do this if you won't be using the iPad for a few days or if it just isn't acting quite right. You can turn the iPad back on by simply holding the power button until the Apple symbol appears. The second way to restart your iPad is called a "hard restart" or "hard reset". You might need to do this if restarting doesn't fix your problem, the ipad is frozen or won't slide open. To complete a hard restart, hold the home button and power button together until the ipad powers off and the apple symbols appears. 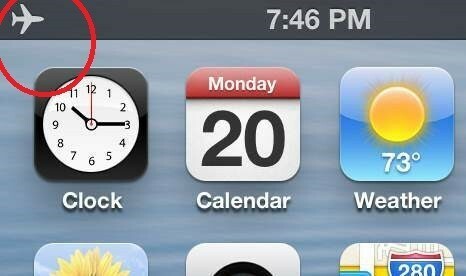 Once the Apple symbol appears you can let go. Leave the iPad alone until it has completely restarted and the Slide to Open screen appears. ** You should only perform a hard restart as a LAST RESORT and only if you can not restart it. There are a few things to check when this happens. 1. Use the volume controls on the side of the iPad to make sure the volume is turned all the way up. 2. Check the volume by swiping up from the very bottom of the iPad to get the Control Center and moving the volume slider all the way over. I Can't Use My Photos in this App! That means at some point, the app was told "Deny Access to the Photos". This fix is easy if you know where to go! 3. Find the Photos symbol and tap. 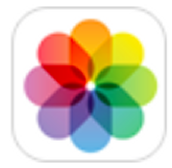 A list of all the apps that use the photos will appear. 4. If the button beside the app is green, the app has access to the photos. If it is grey, it does not. Adjust these buttons as you need. I recommend turning them all on (green) so you don't have to worry about it! There's Nothing Recording in this App! That means at some point, the app was told "Deny Access to the Microphone". This fix is easy if you know where to go! 3. 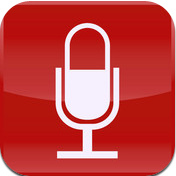 Find the Microphone symbol and tap. A list of all the apps that use the microphone will appear. 4. If the button beside the app is green, the app has access to the mirophone. If it is grey, it does not. Adjust these buttons as you need. I recommend turning them all on (green) so you don't have to worry about it! Make sure your iPad is connected to WIFI. Your iPad may be in airplane mode which temporarily disconnects the Wifi. This helps if the internet is running slow. When you turn on Airplane mode, you open up more bandwidth. Think of bandwidth as a lane on the internet highway and when you turn on Airplane mode, you take a row of cars out of that lane. It allows other cars to travel faster with less resistance. 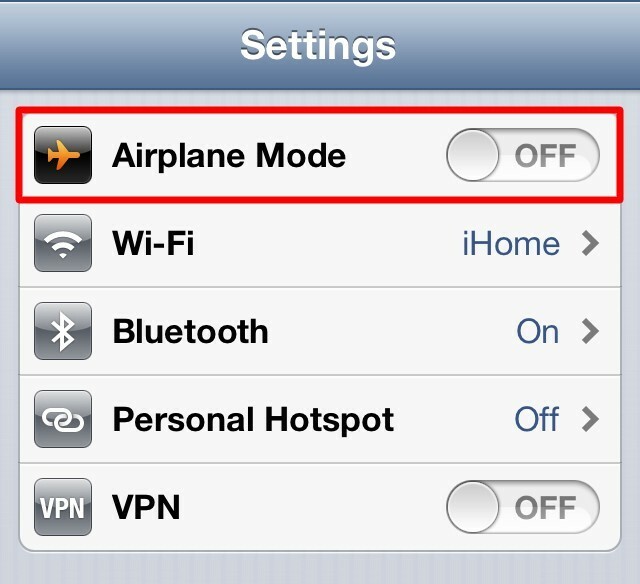 If you will not be needing or accessing the internet on your iPad, turn on Airplane mode by going to the Settings and turning the button beside Airplane mode green. When you do this, you will notice that the Wifi underneath it say "Off". When Airplane mode is turned off, Wifi will say "Not connected" for a few seconds until it finds the internet signal and then the network will appear. 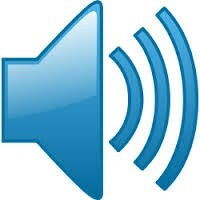 If you see this symbol your iPad is in airplane mode and will not connect to the internet. When on the home screen, swipe up from the bottom and this menu will appear. The Wifi symbol should be lit up to be connected to the internet and the airplane symbol should be darkened. 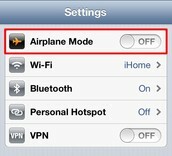 You can also turn airplane mode on and off in the setting menu. You should be familiar with your settings from an earlier challenge! My iPad Screen Won't Rotate! Oh no! Chances are if your iPad screen will not turn from portrait to landscape or landscape to portrait then the rotation lock is enabled. Simply swipe up from the bottom to access the menu. Make sure the lock with the arrow is not turned on. If the button is white, it is on. If the button is dark, it is off. If this fix will not work, go to Settings. Click on General. 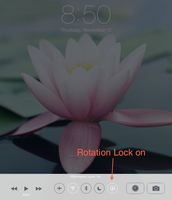 In that menu, check to see if the side switch is used to mute the iPad or lock rotation on the iPad. 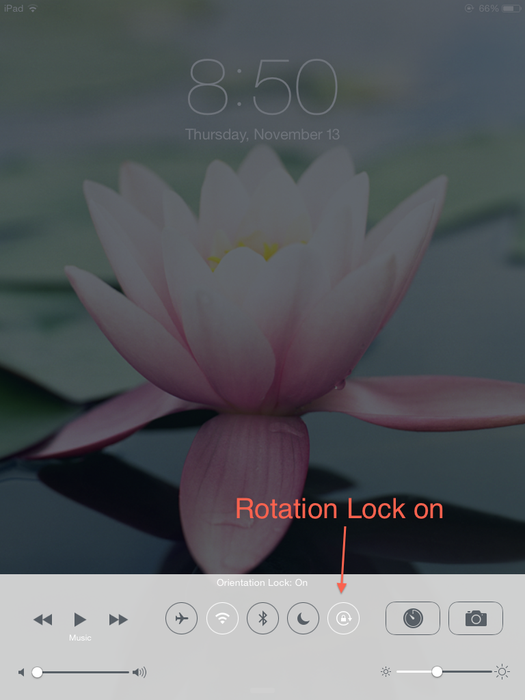 If the side switch is used to lock rotation on the iPad screen, slide the side switch so the orange dot is not showing and your iPad screen should rotate now. The screen will not rotate. 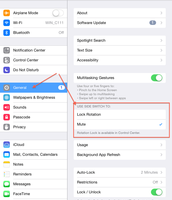 You can decide whether the side switch mutes the volume on the iPad or locks the rotation on the side screen. Occasionally you will try to record in an app and it just won't record. This is typically a storage issue. This means there is too much stuff on the iPad. If it is a student iPad, this could mean pictures (selfies or others!!) or videos sitting in the Photos or Camera Roll. The simple fix is to delete anything that is unnecessary. If you can't do this, you may have to delete apps to fix the issue. To delete apps, simply tap and hold the app until it begins to wiggles. When it is wiggling, an X will appear. Tap the app and tell it delete. Do not delete anything you use frequently use or need. 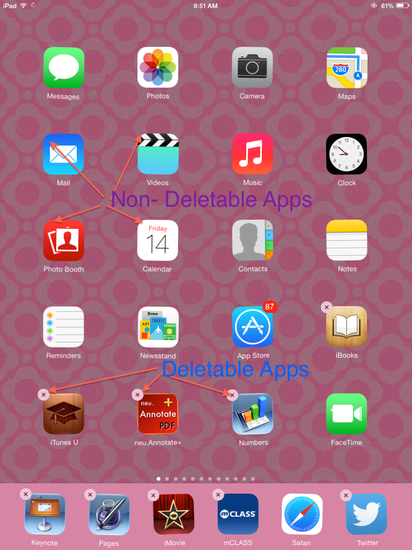 There are a few apps that are standard Apple Apps and aren't deletable. They will not have an X. To exit the delete mode simply press the home button one time.